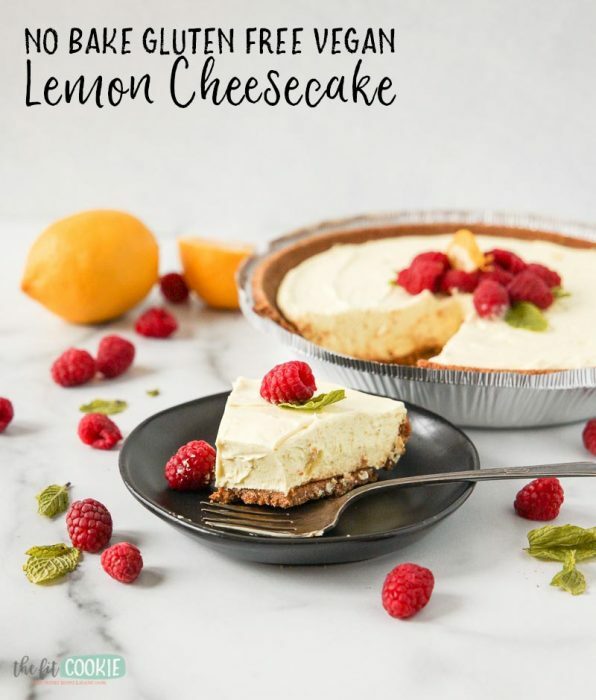 Our perfectly sweet and tart No Bake Dairy Free Lemon Cheesecake is a great dessert for spring holidays! It’s also gluten free, soy free, and vegan. Even though spring is in full swing on the calendar, we just got a ton of snow yesterday and today. But in spite of the cold weather hanging on, we’re still looking forward to fun spring gatherings for Easter and Mother’s Day. 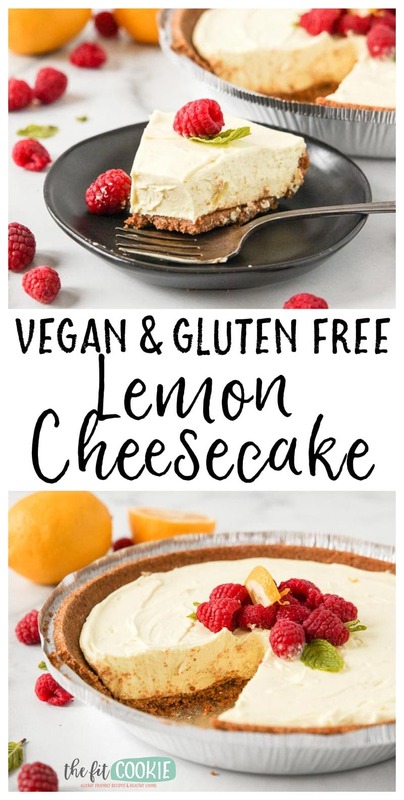 To celebrate spring holidays and add a bright and fruity cheesecake to our collection, I made a delicious and simple No Bake Dairy Free Lemon Cheesecake that’s also gluten free and vegan! 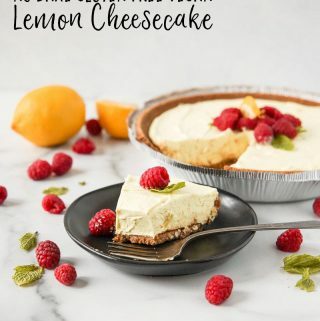 What’s great about all of our cheesecake recipes is that they are made without cashews or other nuts, so they are allergy friendly if your family or friends have nut allergies! Just check the labels on your chosen ingredients (coconuts are not technically tree nuts, but check with your allergist if you’re unsure if you should have coconut). 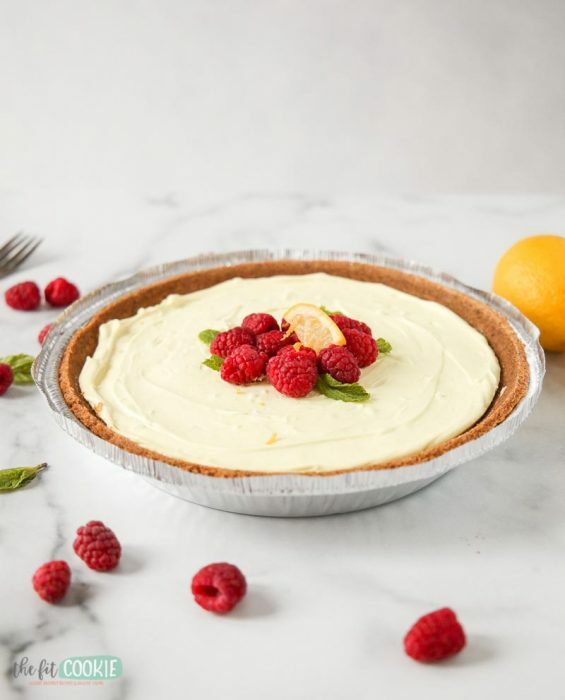 When mixing up your lemon cheesecake filling, make sure you soften the non-dairy cream cheese with a hand mixer first before adding anything else to it. The ensures that everything will mix up smoothly and not have any lumps in it. Then you’ll beat in the powdered sugar, lemon juice, and the other ingredients. If you add the lemon juice right away to the un-softened dairy free cream cheese, it will be a bit harder to mix and look lumpy at first. 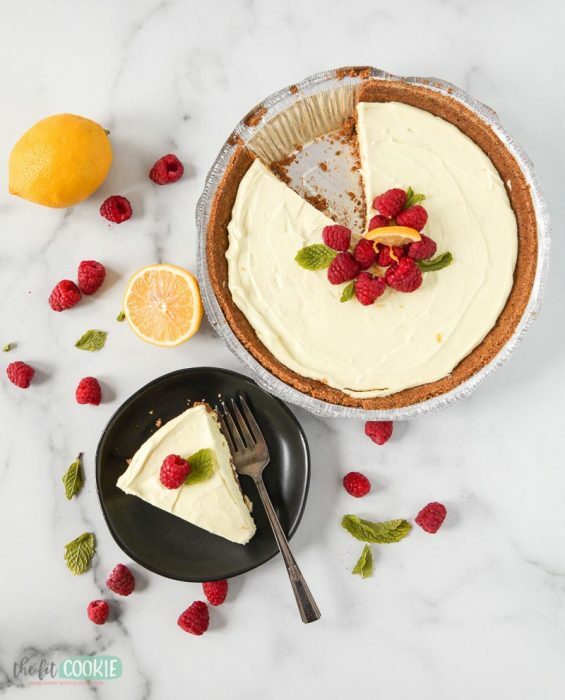 To add a nice yellow color to this lemon cheesecake, we added some natural food color powder from McCormick, but that’s completely optional. You don’t have to make this yellow if you prefer to keep it white. The McCormick natural yellow color I used has a slightly green tint to it, so it won’t look quite like an artificially colored lemon cheesecake. How do I make a cookie crust for cheesecake? 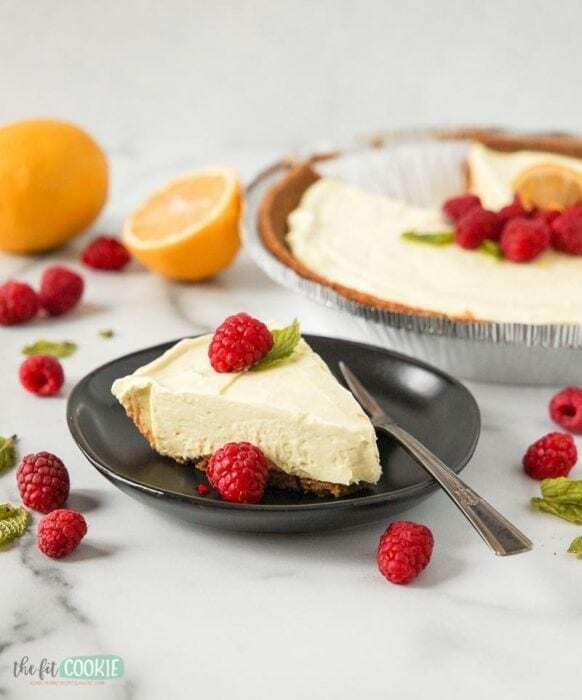 We use the Mi-Del gluten free graham-style pre-made crust in a lot of our cheesecakes since it’s super easy to use and it’s yummy, but you can always make your own gluten free cookie crust for this cheesecake using Kinnitoos vanilla sandwich cookies. We show how to make a sandwich cookie crust in our Triple Chocolate Vegan Cheesecake recipe, all you’d need to do is replace the chocolate gluten free sandwich cookies with the vanilla Kinnitoos sandwich cookies for this recipe (unless you want chocolate and lemon together). 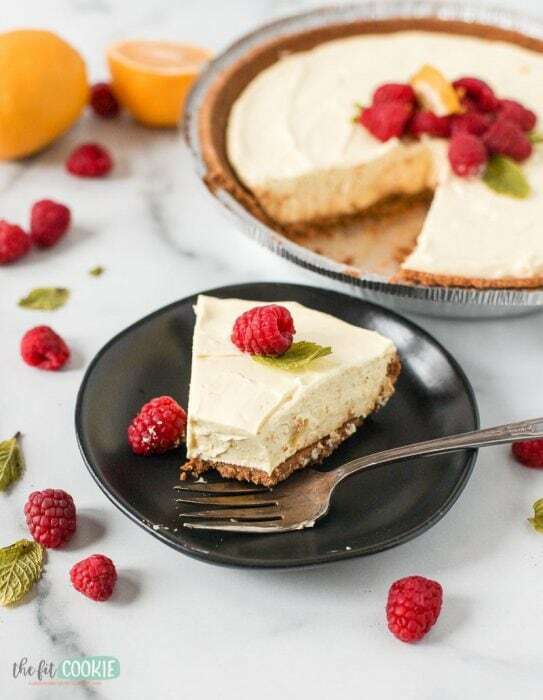 It’s really easy to make and makes an awesome no-bake cheesecake crust! You process the sandwich cookies in a food processor, mix with some melted coconut oil or melted Earth Balance Soy Free margarine, press it into a pie plate, then chill till set (check out the recipe I linked above for exact measurements). If you can have gluten, you can try making a cookie crust with lemon Oreo cookies if you want a bit more lemon in your dairy free cheesecake! 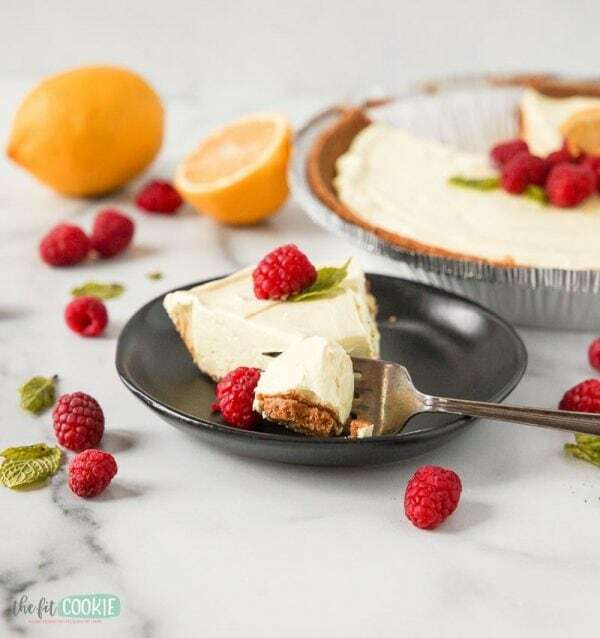 Check out our other no bake vegan cheesecakes made without cashews! In a large bowl, beat the non-dairy cream cheese with a hand blender to soften it and make it smooth. Then add the powdered sugar, natural yellow food color, and the lemon zest. Then beat in the lemon juice and vanilla, mixing well so the cheesecake mixture is smooth. Add 1/2 of the container of CocoWhip to the bowl and beat together with the cream cheese mixture until it’s smooth and mixed thoroughly, then fold in the remaining CocoWhip by hand with a spatula. Spread the cheesecake mixture into the pre-made or homemade cookie crust, spreading out to make it smooth on top. Chill for 4 or more hours, until it is chilled and has firmed up. Serve topped with raspberries or strawberries and mint leaves for garnish. Enjoy!